Convert FLAC audio to MP3, WMA, M4A, AAC and 1000+ audio/video formats. Edit FLAC audio files with trimming, changing bit rate, customize sample rate, etc. Versatile toolbox combines screen recorder, GIF maker, fix video metadata, burn CD, etc. FLAC file format is the audio codec that is basically a lossless musical format, in other words, it retains sound quality without any loss. But on the other side, it is bit space capturing when we talk about MP3 format, which refers to digital audio coding format. MP3 follows a standard technology that results in better compatibility at a quite small size when compared to FLAC format. Thus, if you need to get an audio format that captures less size as well as provides compatibility to most of the media player services and different devices, then converting FLAC to MP3 through a FLAC to MP3 converter freeware will be a good idea. Wodershare Free Video Converter is one of the great and remarkable applications from Wondershare. It has got captivating features that wholesome for video formatting operations. 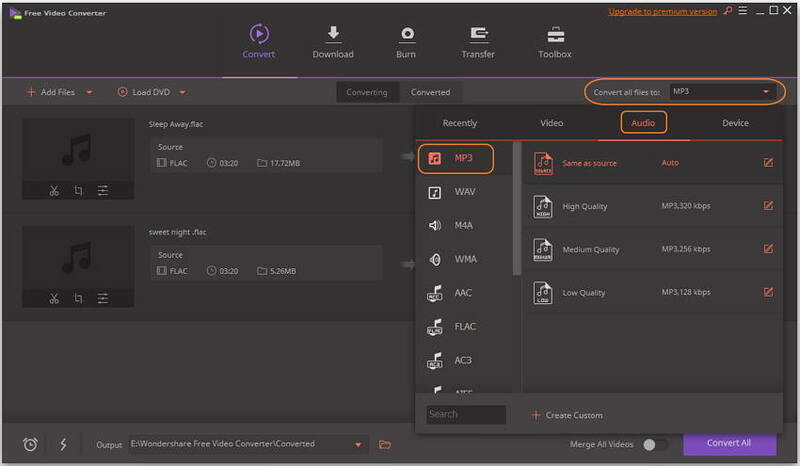 With the ability to convert to numerous file formats as well as edit the videos, Wondershare Free Video Converter is to my knowledge, the best and most recommendable software. It also features the ability to free convert FLAC to MP3 and is the best free FLAC to MP3 converter. This software is fully compatible with Windows and Mac operating systems and works smoothly on them. It has fast conversion speed and the output quality is remarkable and of high-quality. Wondershare Free Video Converter is the best free FLAC to MP3 converter available. Launch Wondershare Free FLAC to MP3 converter and click the Add Files button under the Convert section to insert FLAC files. You also have the option to drag files and place them on the main dashboard. When the file is done uploading, select the MP3 from the Audio tab as the output format, which is under the Convert all files to: drop-down list. You can hit the Convert All button to start converting FLAC to MP3 for free, and you can find the converted files from the Converted tab. 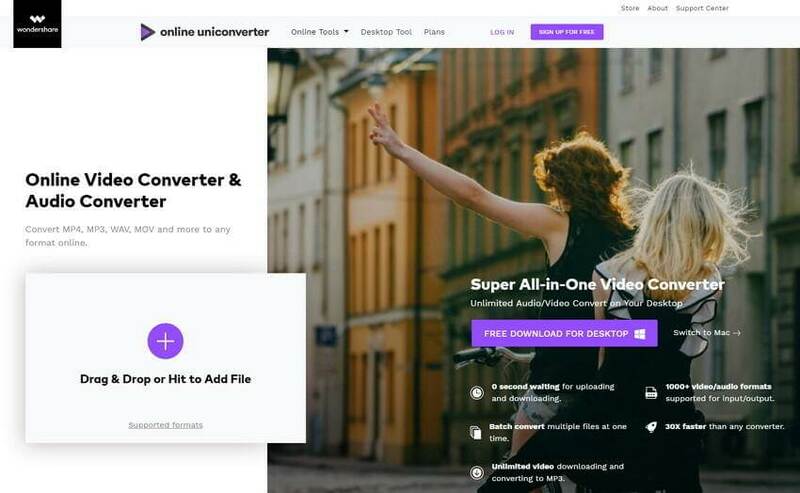 Wondershare UniConverter (originally Wondershare Video Converter Ultimate) is the upgrade version of Wondershare Free Video Converter, which provides more powerful and stable converting services ensuring you get converted .mp3 files without quality loss. Proceed to learn How Wondershare FLAC to MP3 Converter Works >>. 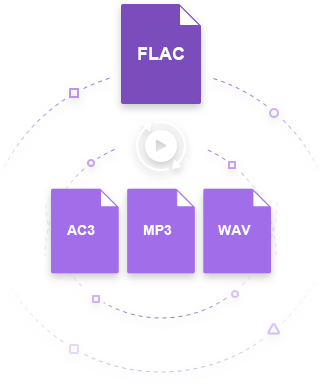 Free FLAC to MP3 Converter is a simplified yet powerful software that harmonically executes the free FLAC to MP3 conversion. This free FLAC to MP3 converter is easy to use since the dashboard has all the required operation features on the main interface. It is compatible with Windows. The conversion process is rather quite simple, by either just dragging and dropping or adding files for conversion to the software. One can batch convert using the software. It also incorporates a metadata editor. Simplified and easy to use software. Only supports a limited number of file formats. Step 1. 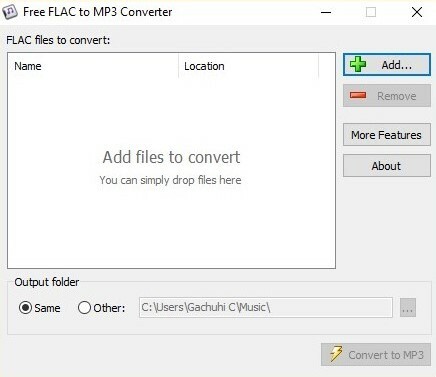 After you are done with downloading, Launch the free FLAC to MP3 converter and click the Add... or directly drag and drop FLAC files to the primary interface from your PC. Step 2. Click ... to specify the destination folder to save the converted MP3 file. 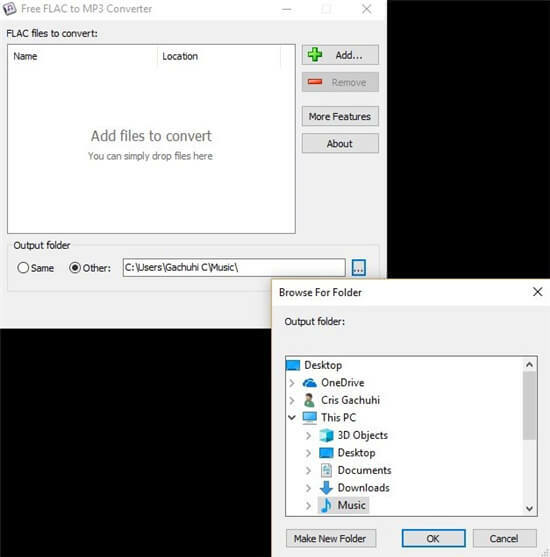 Note the free FLAC to MP3 converter automatically saves in the original files folder, you can change it to a different or new folder for easier location based on your preference. Step 3. When everything is set, hit the Convert to MP3 to start free converting FLAC to MP3 right away. This is a MacOS software that really executes exemplary. It has great features and comes in handy to convert FLAC to MP3 free. It is a FLAC to MP3 converter freeware available on iTunes. It has got batch processing abilities and supports conversion to numerous file formats. 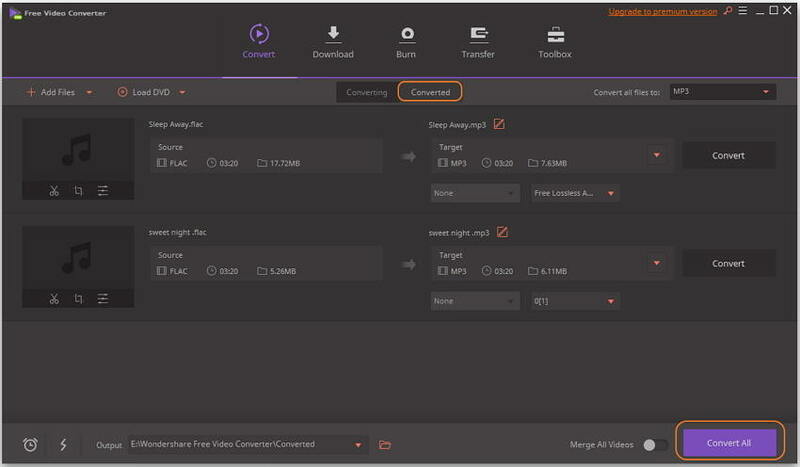 It features editing, extracting, merging and trimming options to get an audio or clip from a video. It supports the latest MacOS version as well as other later versions and can be used to share the converted files to other iOS devices with ease, and you are certain the media files will play on them. Has editing, extracting, and merging functions. Certain features require some know-how to execute - It's a bit complex to the first-time user. Step 1. 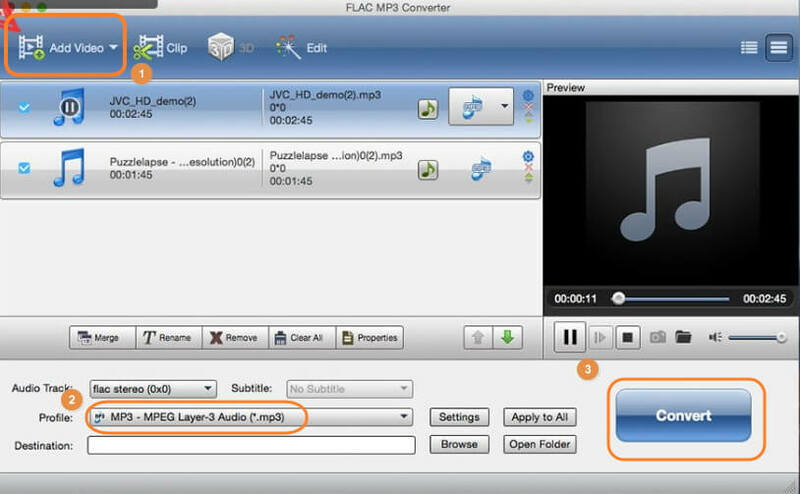 Launch the FLAC MP3 converter on your Mac and click Add Video to add your FLAC file. Step 2. Click the drop-down arrow beside Profile and choose MP3-MPEG Layer-3 Audio to confirm MP3 as the output format. Step 3. Hit the Convert button when all is set and get your converted file from the provided destination. Here is collection of FLAC Mac Converters for your information. Online UniConverter (originally Media.io) is a FLAC to MP3 freeware site that can convert FLAC to MP3 online free. The site is stylishly built and works exquisitely as a free FLAC to MP3 converter. The site is outstanding and has got fabulous conversion features. It enables conversion to many different file formats. It supports popular file formats conversion. Conversion using the site is really simple. 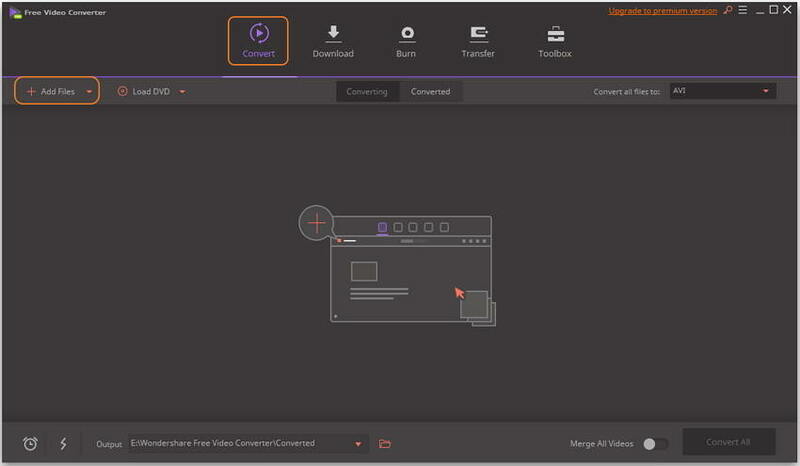 Open https://www.media.io/convert/flac-to-mp3.html in your browser and locate the FLAC file to be converted and upload it to the site by clicking on the Drag & Drop or Hit to Add File button. Select the MP3 as desired output format from the Convert all files to: drop-down list. Hit the CONVERT button to execute the FLAC to MP3 online conversion process. When the process is done, a button to download the converted file will be provided. Stylish site, that is easy to use. Enables conversion to multiple file formats. It is a free online converter. The converting speed is up to the network connection. Can't load a file larger than 100 MB. 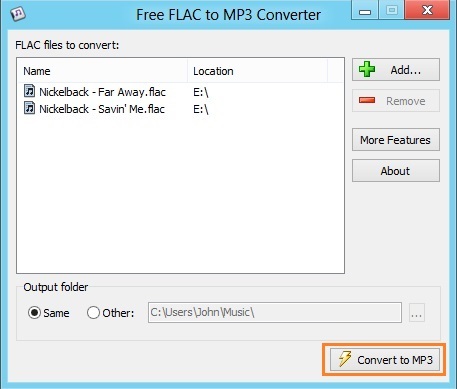 This free FLAC to MP3 converter online is specifically built to convert FLAC to MP3. flac to mp3 online is a FLAC to the MP3 online free converter. The site is elaborate and produces high-quality output after conversion. The conversion process is automatic and a download link to the converted file is provided after conversion. Upload the FLAC file either from PC, Cloud or via URL. Since it is a FLAC to MP3 converter only, wait for the conversion process to take place as it is automatic. In the end, a download link to the converted file will be shown. You can safely use it to download your converted file. Only supports FLAC to MP3 conversions. Does not support batch conversion. Don't support large size file. Searching for a tool to convert FLAC to MP3 free is an endeavoring task in itself and getting the best tool is at times a complex affair. Described are some of the best free FLAC to MP3 converters both online and offline. To my knowledge, Video Converter Free is simply the best tool for the job, it is fast and effective with a stylish dashboard. Most of all it is free. You may also try the other converters for yourself and see how they execute.